Never Enough Nails: Barielle Glitter Mania for Spring 2015 Swatches! The weather is starting to get nice finally and I'm in the mood for some fun spring manis. The new Barielle Glitter Mania collection is perfect for bright and cheery spring nails. Barielle Confetti is an aptly named mix of multi-colored matte hex glitters in a clear base. It really does look like confetti, thanks to the matte finish of the glitters and black, white, hot pink, baby blue, and peach colors. Confetti is a really fun glitter and I think it's just perfect for layering over any spring bright or pastel shade. I used two dabbed coats of Confetti over Barielle Heaven Sent. Dabbing worked best here to space out the glitter evenly over my nails. It was pretty easy to apply this way, but I did have to move the glitter around a bit because it liked to concentrate itself all it one spot. Barielle Princess Pink is a metallic pink glitter with a clear base. Princess Pink has a couple of different sizes/shapes of the same color metallic pink glitter, so it's more interesting looking than glitter that is all the same size. This is just one coat of Princess Pink and the coverage was pretty good. I thought it was easy to apply and I used regular brushstrokes, not dabbing, for this. I used Barielle Gray Sky as my base. I like grey and pink together a lot and this would be a great rainy day spring mani! I have two favorites in this collection and Barielle Gemstones is one of them. 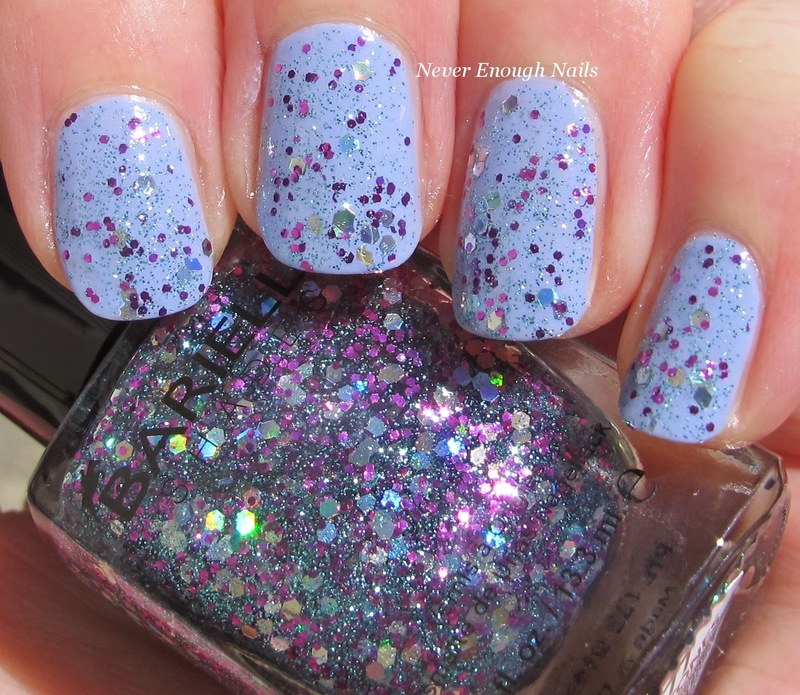 Barielle just calls this a "multi-colored glitter", but that hardly captures it's true magic! Gemstones has teeny blue microglitter, larger silvery blue holo glitters and metallic purple orchid glitters in a clear base. I am such a sucker for glitters that mix blues and purples, so naturally, I love this! I love that the larger blue glitters are holo, they give a nice rainbow flash. This is one coat of Gemstones over Barielle Rain in Spain (also a favorite of mine!). Gemstones was very easy to apply and I liked the coverage I got in one coat. I think this one could be worn alone in a couple of coats if you wanted, but I love it over Rain in Spain. I did regular brushstrokes to apply this and the glitter spread around evenly. The consistency was perfect too, not too thick with base. Ooooooh I do like a good teal and copper combo!! 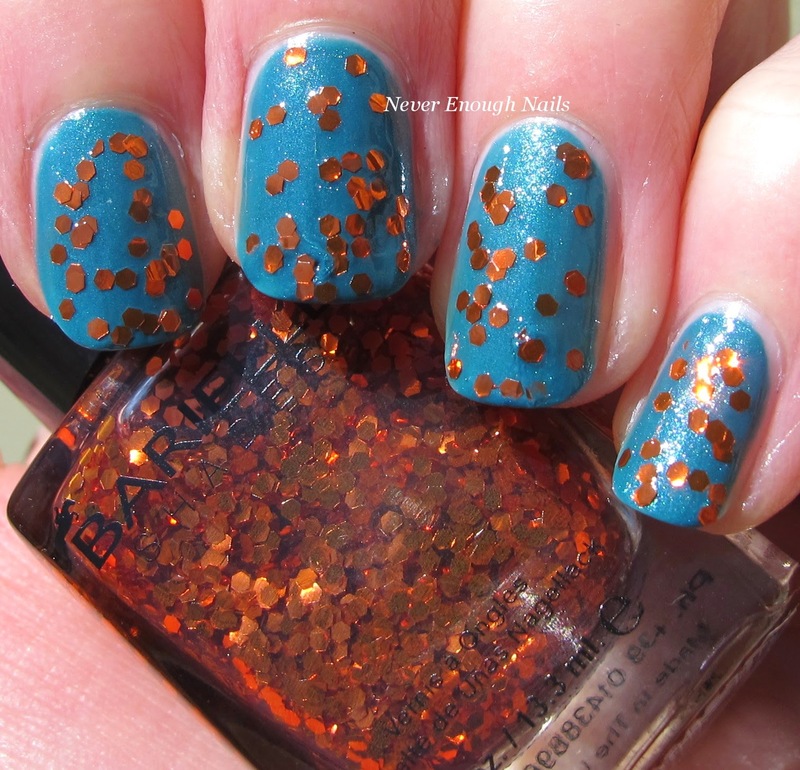 This bright copper penny glitter topper is Barielle Orange Flame. 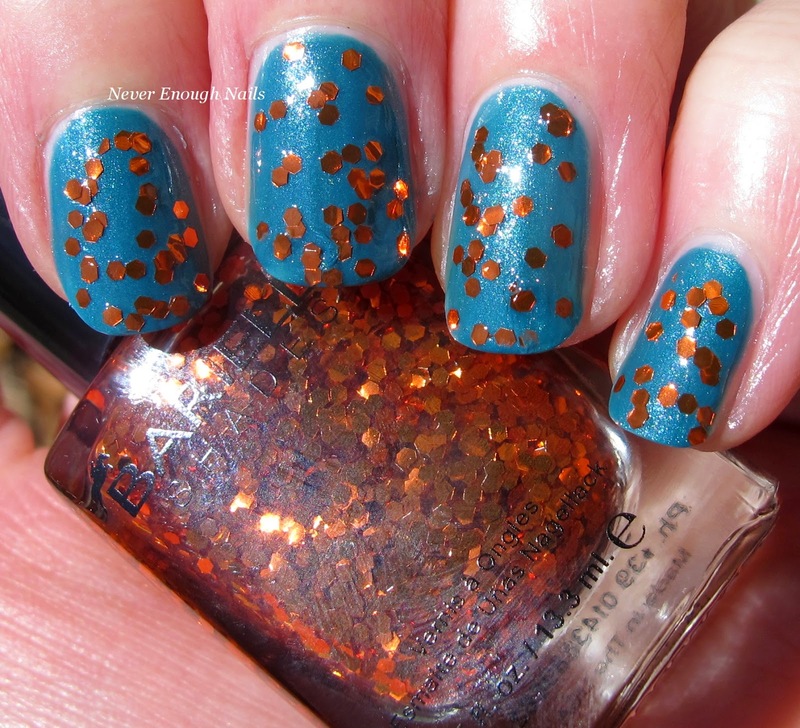 Orange Flame has fiery orange-y copper hex glitters in a clear base. I actually have been looking for a glitter topper that only has copper glitters. I find that they are usually mixed with other stuff. I love the way copper looks with blue and teal, so I'll be wearing this a lot! This is one dabbed coat of Orange Flame over Barielle Under the Sea. With these larger hex glitters, I think it's easiest to dab (like I did with Confetti). Then you can spread them around more evenly. The glitters did have a tendency to want to stick together though, so work fast and spread them out before the polish sets up. Remember I said I had two favorites from Glitter Mania? Yea, this is the second one. Barielle Mermaid's Fin has beautiful twinkling silver holo small glitters and matte aqua hex glitters in a clear base. With a name like Mermaid's Fin, I'm pretty sure I was destined to love this polish. 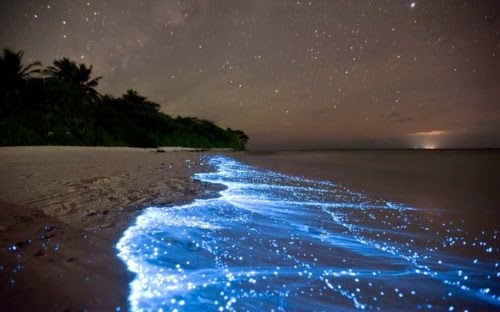 The combo of the small silver holo glitters and the pastel aqua hexes reminds me of beautiful bioluminescent plankton in the ocean (below, photo from Tumblr). This is one coat of Mermaid's Fin over Barielle Midnight in Paris. I used regular brushstrokes to apply this and it was nice and easy to work with, no troubles. The consistency was great and the holo glitter is plentiful! The Barielle Glitter Mania is a great little collection for the glitter enthusiast like myself. My top two favorites of the collection are Mermaid's Fin and Gemstones, but I really like Confetti and Orange Flame too. Being not a pink person, I could live without Princess Pink, but it's nice if you're looking for a metallic pink glitter topper. 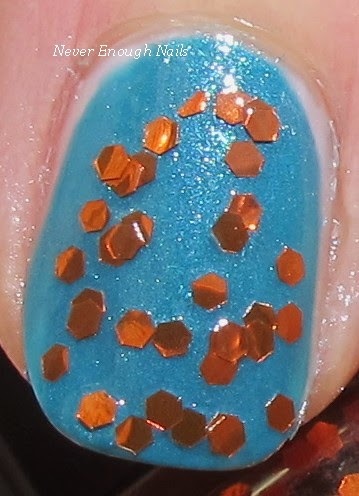 April is Barielle's blue month, so I wanted to layer some of these glitters over lovely Barielle blues. They really make fantastic blue polish! You can enter to win $50 of Barielle products by submitting your blue nail art on the Barielle Facebook page. The Barielle Glitter Mania collection is available now at barielle.com.